This routine is designed to hit every muscle fiber of your midsection. Use these moves to train your abs at least twice a week and take your abs from flab to chiseled. Getting a great six pack is more about working smarter not harder. You do not an expensive home gym machines to do these exercises so you have no excuses. One of the most common mistakes when it comes to abs training is over training. Your abs are actually very small muscles that do not need to be trained as hard as your larger muscle groups. Do not complete an entire ab workout more than twice a week. Also be sure not over burden your abs when doing any weight exercises. It is extremely easy to pull an abdominal muscle. Before we look at the exercises we must talk about cardio. Without cardio training your abs will never pop. Make sure you are doing some type of cardio workout at least 3 times a week. The best type of cardio is interval training. This is a simple method of switching between periods of high intensity and low intensity. Following this method you will ignite a fat burning fire in your belly. Here are 9 of the best exercises for killer abs. Follow the recommended number of reps and sets for maximum results. Perform 3 sets of 20 reps. Perform 1 set of 20 reps on each side. Perform 3 sets of 15 reps on each side. Perform 2 sets of 20 reps. 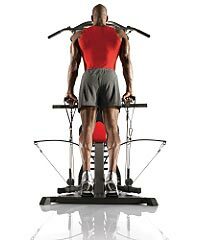 Perform 3 sets of 10 reps per person. Perform 2 sets of 10 reps. When it comes to getting great abs you can not ignore the importance of lowering your body fat. The less body fat you have the more definition your abs will have. No amount of exercise will make up for poor dieting. Eat right and exercise using these lifts and you will get a great six pack. Next time you get on your universal home gym make sure to work your abs the right way and you will start getting results.